BERLIN — The State of Qatar enjoyed its best-ever participation at ITB Berlin, one of the world's premier travel trade shows, with a string of awards for its national airline, tourism board and chairman of both organizations, Akbar Al Baker. The exhibition organizers to have the second and third best Middle East stand, respectively, at the five-day event held in the German capital adjudged Qatar Airways and Qatar Tourism Authority. The prominent Pacific Asia Travel Writers Association (PATWA) also honored Al Baker with the 'Aviation Man of the Year' award for his achievements in turning Qatar Airways into one of the fastest growing airlines in the world. Since taking the helm at Qatar Airways in 1997, Al Baker has developed the airline from a four-aircraft operation and small route network to a fleet size today of 39 planes flying to 59 destinations around the world. ITB Berlin attracts hundreds of exhibitors and tens of thousands of visitors each year and is a key platform for travel professionals from around the world to strengthen business relationships. 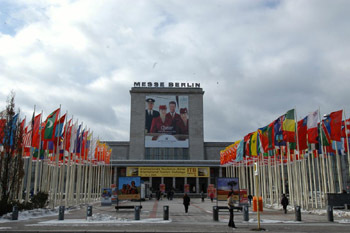 The exhibition grounds are so large that the show is spread across more than 20 separate halls. Qatar Airways' award-winning stand was a unique two-tier feature with a reception desk, seating area for meetings and presentations, and a refreshment area where Qatar Airways cabin crew served Arabic coffee and dates. The upper floor was turned into a VIP area reserved for key meetings. The exhibition stand also had a 6 meter curved graphic feature wall in Qatar Airways' corporate colors of burgundy and gray. Qatar Airways literally stole the limelight at ITB Berlin with a huge billboard featuring an image of four-cabin crew above the entrance to the exhibition grounds that provided visitors with a first impression of the award-winning airline. Qatar Tourism Authority, the Qatari government-run agency promoting tourism, exhibited next to the national airline with a castle-shaped stand that was both modern and traditional with Arabic carvings showcasing Middle East culture. Al Baker said: "I am extremely proud, on behalf of Qatar Airways, Qatar Tourism Authority, and the employees of both these organizations, to earn such distinguished awards at ITB. "Qatar is gaining a reputation worldwide for innovation and achievement for its evolving tourism industry and rapidly-growing national airline. The country is being put firmly on the global map and we are moving in a positive direction towards greater things to come." 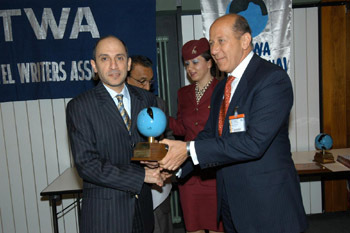 Of his award by PATWA, Al Baker expressed his delight for being honored during the ceremony, which was held on the sidelines of a seminar about the effects of the Asian tsunami disaster on the aviation and tourism industry. During ITB Berlin, Qatar Airways promoted its new Business Class and latest destinations of Johannesburg, Cape Town and Seychelles by giving away tickets in the premium cabin through a raffle draw. In addition, Japanese drummers entertained visitors on the stand and sushi was served to promote Osaka, the airline's newest and 60th route, which will be launched from Doha four times a week, beginning on March 31. Al Baker outlined Qatar Airways' German and global expansion plans over the next two years during a press conference at ITB, attended by more than 100 media from around the world. He announced that Qatar Airways would be able to increase the number of flights between Qatar and Germany from the current 11 a week to 21 by Winter 2006. The expansion is the result of a successful round of bilateral discussions held recently between the governments of Qatar and Germany. The airline will also operate dedicate freighter services between the two countries for the first time. From 27 March 2005, the Doha - Frankfurt route will be served daily, increased from six flights a week and operated by an Airbus A300 in a three-class configuration of First, Business and Economy. The Doha - Munich - Vienna route, currently operated five-times-a-week, will be de-linked and replaced by dedicated non-stop services to both European cities. Munich will continue to be served five-times-a-week with an A300 in a three-class configuration, while Vienna will have four flights a week operated by an Airbus A319 configured in Business and Economy. Al Baker explained that the airline will be able to phase in the increased frequencies to 21 flights and three more German destinations by Winter 2006, which will facilitate travel for the German market to Doha and beyond to the Middle East, Far East and South Africa. Qatar Airways will expand the number of routes further from May 2 when Tunis and Algiers join the network, followed by Athens on June 15.